This year I work with a couple fruit enthusiasts. Sometimes the three of us would take a break during our work day to walk and check out different plants in the neighborhood. Since I work just 4 blocks away from home, we are basically checking out the edible plants in my neighborhood. A couple months ago we looked at this tree in the photo above. At the time it did not have fruits. Today we went back to the same tree with a book called Tropical Fruits and Other Edible Plants of the World by Rolf Blancke in attempt to identify this tree. Unfortunately, we could not find anything in the book that looks exactly like what we saw. In addition to the flowers and premature fruits on the tree, I also found a ripened fruit on the ground. I picked it up to show my coworkers. One of them pulled it apart using her hands. We all had a good look inside of it. I even tasted it by touching it with my finger first. It was sweet. Since both of my coworkers have been looking through the tropical fruits book for the past several weeks, it was my turn to look at the pictures. As I flipped through the pages, I saw a fruit which could possibly be what we saw today. The photos in the book for each fruit are very limited. It has either one or two photos only and usually they are pictures of the fruit and leaves. Every time I saw a possible candidate, I typed it into Google Images for more photos. After about 3 tries, I found the mystery fruit. 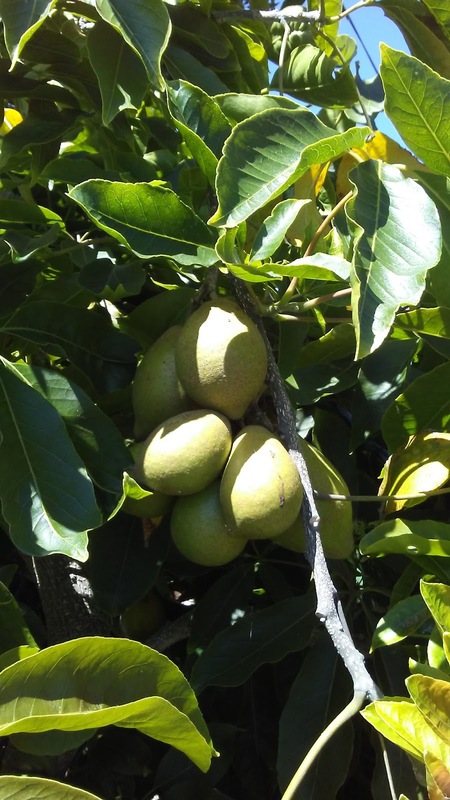 It turned out to be white sapote! 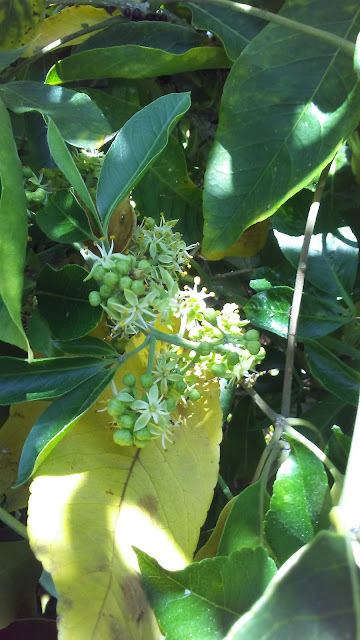 I was able to find many images of the trees, flowers, ripe fruits and fruits on the trees, etc. It was a perfect match. By the descriptions of white sapote, it sounded delicious. We didn't really try the slightly rotted fruit on the ground because we didn't really know what it was even though we suspected it was edible. I will be walking Cracus toward the direction of the white sapote tree from here on. I have a new "Free" site that I used. Craigslist.org used to be my "free" site, but in the past year Nextdoor.com has become my favorite free site. Now I only pick up free stuff from my own neighborhood and very often I just walk over to pick them up. This morning I walked the dogs to a house not too far away pick up some free Calandrinia grandiflora cuttings. I have seen these flowers in the neighborhood and thought they were really pretty, so I was very excited to get some free cuttings. 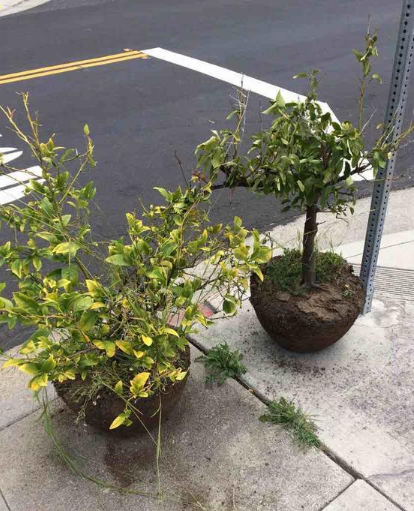 A few hours later, someone else nearby posted "free lemon and lime tree (see photo above)". Initially, I was going to pass, then I thought how I have wanted a lime tree for many years. I Googled how to tell a lemon from a lime tree, and decided to swing by the trees with the car. 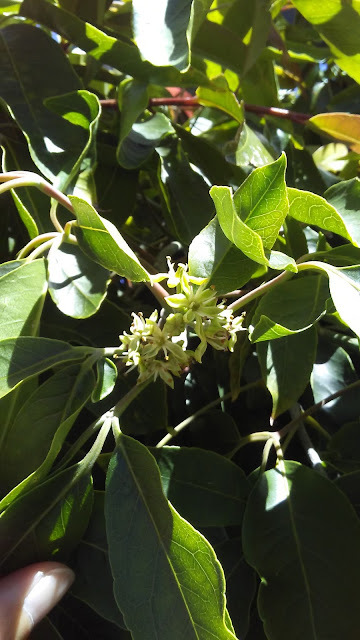 I smelled both trees, but I really could not tell the difference, so I just had to pick the one with smaller leaves (the one on the right) and hope that is a lime tree. I already have unlimited access to free lemons, so it would be a waste of effort if I had picked the wrong one. Initially I was going to plant the lime tree in a planter, but I decided it would be best to plant it in the garden. I have always thought the big jade plant was wasting a prime spot in the garden. It's not particularly pretty, and it doesn't produce anything useful. A couple weeks ago, the 13-year-old girl next door even said that jade tree is kinda ugly, and that I should get rid of it and plant something else! I just started cutting down the jade plant with my Pocket Boy. It didn't take long for me to get to the roots. I dug up as much roots as I possibly could. My arms were shaking as I finished prepping for the planting location. Before I put the lime tree into its place, I clipped off some branches that didn't look too good. They were covered in scale pests. I also removed some soil around the roots. As I placed it in the hole on the ground, I mixed in some compost and covered it all up with soil before watering the tree really well. It looked a bit dry. It took over 2 hours to complete this project. The weather got warm as I worked the soil and dug up the river rocks and the roots. I was pleased how good the new tree looks in its new home. It already has several buds and possibly baby limes. It would be so cool to pick limes from my own garden. I guess I will find out soon enough. 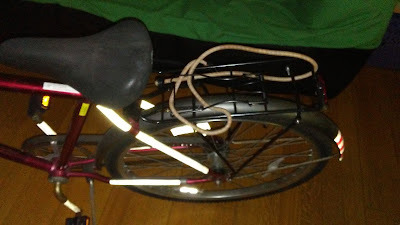 Ever since I rode the bike on Bike to Work Day, I had been thinking about how I could ride the bicycle with Cracus. 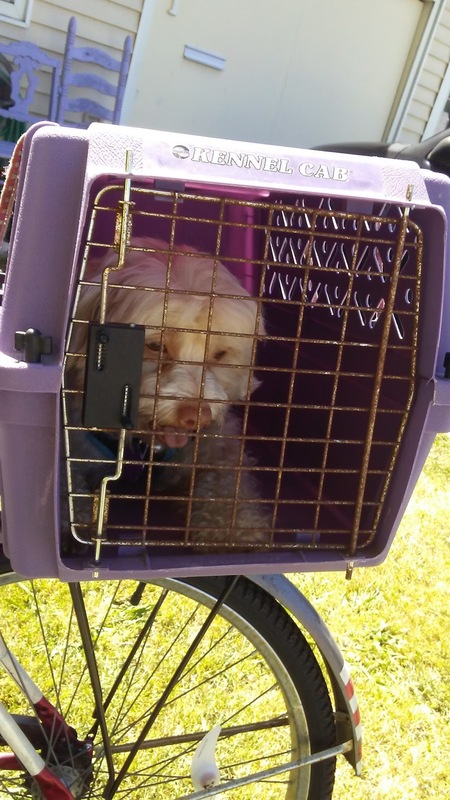 I figured the easiest way to carry Cracus around on the bike would be putting him in his crate. He is familiar with his crate and is safe in there. I wouldn't have to worry about him jumping out of a box or a basket. His traveling crate is small enough to be strapped behind me on the bike. I realized that I needed to get a rear carrier rack in order to strap the crate to the bike. After looking around online, I found Ventura universal rear rack. It was the only one I thought that could possibly work with my bike. I was lucky to find a youtube video on how to install Ventura universal rack on a cruiser bike, which further confirmed that it would most likely work on my bike. 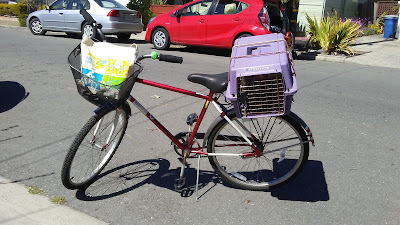 I found it for sale on eBay for $16, which was super cheap compare to all the other rear racks. It arrived in just a few days, and it didn't come with any hardware just like the one in the youtube video. I went through my collection of random screws and nuts, and luckily, I was able to mix and match and got the rack installed after several tries. It supposed to be able to hold 55 lbs. of weight. After getting a few bungee cords, I practiced strapping the crate securely then invited Cracus into his crate. He eagerly went in there and took his crate treats joyfully. I took the bike out on the street, walked over to Ohlone Greenway. Cracus did not make a sound the entire time. I hopped on the bike and rode down the trail. He never made any noise. After riding a few blocks, I rode back home. It was hard to tell whether Cracus enjoyed it. I had to put the crate sideway, so Cracus was not able to get the effect of wind blowing on his face. I could tell he was hot being in the crate, so we ended his first bike ride. Next time we will go for a longer ride and stop somewhere interesting so he can also walk around. Today was the annual Bike to Work Day. Many cities around San Francisco Bay Area participate in this annual event including City of El Cerrito. The City hosted an energizer station from 7 am to 9 am next to El Cerrito Plaza BART station to promote the event and the healthy lifestyle of bicycling as a way of transportation and exercise. At the energizer station, city employees handed out goodie bags, snacks, drinks and provided bicycle maintenance tips. For the very first time in my life, I participated in this event. 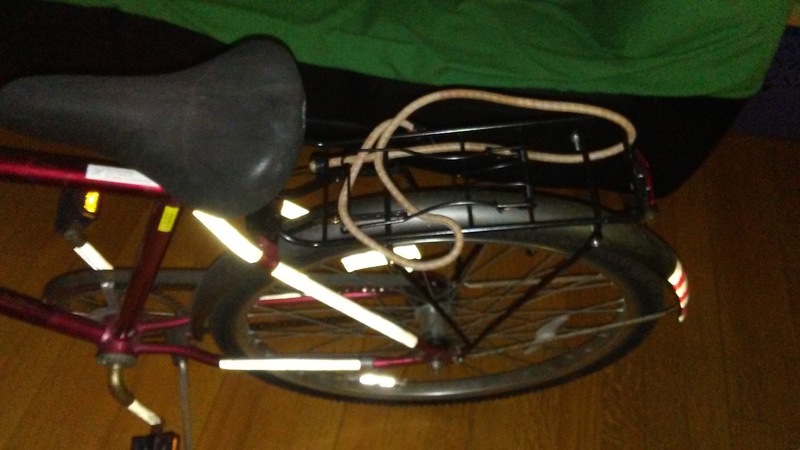 Many years ago I rescued a vintage bicycle from the apartment complex dumpster where I lived at the time. It was covered in tape. I think it was done on purpose to discourage thieves. I removed most of the tape, replaced some parts, and a friend gave it a tune up. It turned out to be a beautiful bike. I can't even tell which manufacturer made the bike. It has just one label that says "Lifetime Warranty call 1-800-USA-Bike for any question". The bike is heavy compare to newer bikes. It also has coaster brakes instead of hand brakes. While I like my unique bike a lot, I don't ride it often. One of the reasons is that I don't want it to get stolen. A few days ago, I decided that I would participate in the Bike to Work Day this year. I got the bike out of the garage and hosed it down in the backyard. I had not been on the bike for many years. I even did a trial ride of 4 blocks to work; however, I had to ride further this morning to get to the energizing station. I didn't see too many bicyclists on my way there at 7:15 a.m. As I got closer, I saw many people and children with their bikes. It was like a party! I had some drink samples of chicha morada and passion fruit from El Mono, the local Peruvian restaurant that I love. I grabbed some snack and a Bike to Work canvas bag filled with goodies. There was a lot of excitement, and I wished that I could stay longer. I didn't want to be late to work so I started pedaling again along Ohlone Greenway. When I got to work, I was 10 minutes early!